Preheat oven to 400 degrees. In a bowl, whisk together olive oil, lemon zest and lemon juice. 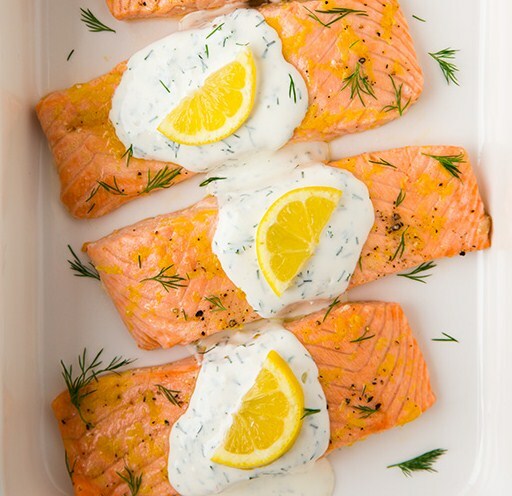 Grease a 13 by 9-inch baking dish and place salmon fillets in baking dish. Season tops of salmon with salt and pepper then rotate to opposite side. Drizzle tops evenly with lemon mixture and gently rub over salmon, then season tops with salt and pepper. Let rest at room temperature 10 minutes, then bake in preheated oven 12 – 16 minutes, or until salmon has cooked through (cook time will vary based on thickness of fillets and how well done you liked them). Serve warm topped with Creamy Dill Sauce. In a bowl, mix together Greek yogurt, mayonnaise, garlic, dill, honey, and enough milk to reach desired consistency. Season with salt and pepper to taste. Store in refrigerator, allow to rest at room temperature 20 minutes before serving (just so it’s not ice cold over warm salmon).